The Galway Congress took place on the weekend of 8th to 10th April, in the Menlo Park Hotel, Galway. Slightly over 100 players took part, and the congress was notable for its usual friendly atmosphere and the good spirit in which the games were played. 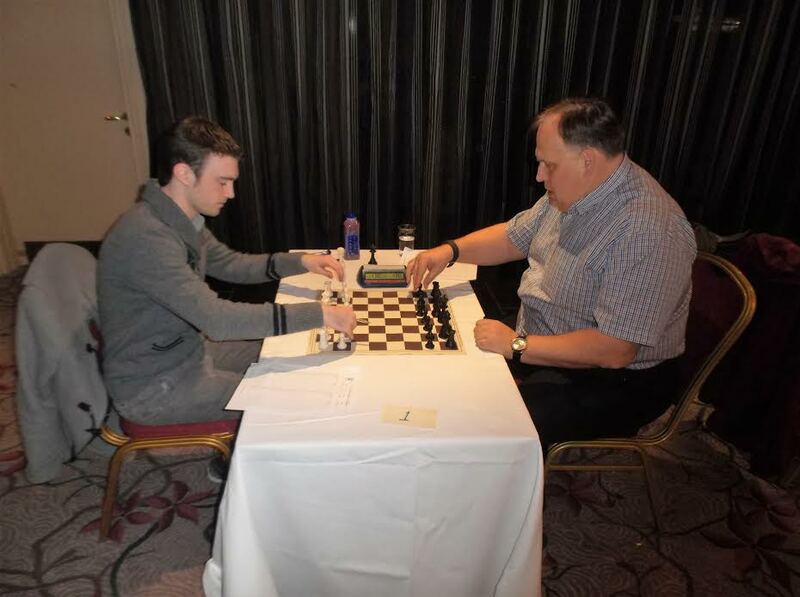 Stephen Moran preparing to take on GM Alexander Baburin in the final round. In the Masters section, Grand Master Alex Baburin was a run-away winner, clinching outright victory with a round to spare after five straight wins (though he then relaxed and conceded a draw in the last round). Alex, Ireland’s long-term number one, has now won the Galway Masters five times (in 2003, 2006, 2009, 2013 and now 2016). Outright second was Philip Short, who also retained his title of Connaught Champion. Third prize was shared by Conor O’Donnell (who won the Irish Junior Championship the week before, and also won the 2015 Galway Rapidplay), Stephen Moran and Gerard MacElligott (all from Dublin). 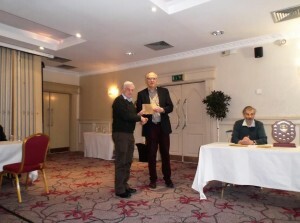 The under-2000 grading prize went to Gerardo Artola, now in Dublin but until recently of Galway. 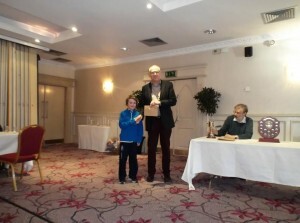 Paddy Divilly, joint first winner of the Majors section, receiving his prize from Galway Chess Club treasurer Andrew. The Majors section was much more closely fought, and the winner was not clear until the very end. When we went to bed on Saturday night, there were two joint leaders on four straight wins: top seed Stephen Jablon from the USA, and Jason Rawlinson from Galway. They met in round 5 and retained their joint lead after an exciting draw; but in the final round they both lost, to Pat McMahon (now of Galway) and Paddy Divilly (Longford), respectively, who were therefore joint winners. Stephen and Jason shared third prize, but were also joined by Galway’s Conall Hegarty (who had won this section in 2013). The 1350-1450 grading prize also went to a Galway player, David Cormican (who won on tie-break ahead of Sean Hunter), whilst the under-1350 grading prize went to Denis Ruchko, yet again of Galway. Martin Fitzgerald receiving his prize from Andrew, with Tournament Organiser, Pete, preparing to present him with the Hugh Finan memorial trophy which is awarded to the winner of the Minors section. Martin Fitzgerald, the winner of the Minors section, copied Alex Baburin’s results in the Masters, with five straight wins followed by a last round draw. Below Martin, there was a very tight finish, with no fewer than six players coming second equal a point behind; four of these six were also qualified for the grading prizes, and so the prize pot was pooled and divided amongst the six. Thus second equal were Maurice Coveney and Zalan Nemeth; second equal and sharing the 700 to 900 grading prize were Colm O’Muireagain and Matthew McInerney; and second equal and sharing the under-700 grading prizes were Bill Delee and Gopal Kavanadala Sridhar. Zalan, Bill and Gopal are all members of Galway club; Bill and Gopal’s performances were particularly impressive as they were previously unrated, having never played in a rated tournament before. putting up photos of the prize winners shortly.